b) Enter .5 instead of ½ to obtain decimal answers. a) Use ESC to exit the current module or DEQME altogether. b) Incorrect Entries – see above - yield the error message: “Invalid Entry”. Press ENTER and correct expression. d) Provide 60,000 of Flash ROM (to check:2nd 6). Deleting or archiving files may be necessary: use 2nd “–“ (VAR-LINK), F4 to select files, then F1 to delete or archive. Archiving might be a good way to manage programs, variables, etc as a loss of battery power may delete any unarchived files. e) Emptying the MAIN folder when starting DEQME will prevent any file reoccurrences (and thus loading error). f) Should Differential Equations Made Easy not start (anymore) or act strange, reset ALL memory (2nd 6, then F1) as memory may be corrupted. g) Use the latest Operating System (OS) using TI Connect. Nothing to worry about. The calculator reorganizes memory for proper functioning of APPS such as DEQME. 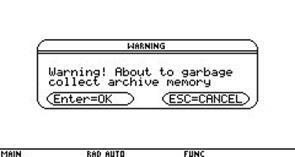 If CME is not properly terminated using ESC, these two error messages may occur. Simply press ESC (up to 50 times) , then restart DEQME. If trouble persists: take out all 5 batteries and reinstall DEQME. 13) 2. Order Differential Equation Solution Checker. Note: Use Single Quote (‘) twice, do not use quotation marks (“). 14) Variation of Parameter for 2. Order DE. 15) Reduction of Order for 2. Order DE. 17) Solve a DE of Order n with constant coefficients by entering its corresponding Characteristic Equation in terms of t.
Nothing to enter for this and for the other PDE’s = Partial Differential Equations. Their solutions are simply displayed here.